So, I got some highly unanticipated free time, so here’s a quick run through some important fundamentals. I don’t care what you do, mastery of the fundamentals is the key to being successful, be it sports, work, or strategy. Strategy: a high level plan to achieve one or more goals under conditions of uncertainty. (one could debate that strategy not just a synonym for plan, we’ll save that for another time). A tactic is a conceptual action implemented as one or more specific tasks (fair enough). So formally speaking the text book definitions from military science and business books goes like this, a strategy is a plan that is executed via a variety of tactics. The military goes on to say that grand tactics are large scale tactics, and grand strategy is the political strategy that provides overall direction to military strategy (i.e. terrorists bad, China OK, Canada Harmless). Gee, that’s actually kinda boring. So how does this help you? Where is the salient advantage in these pedantic semantics? First, the common sense is strategy and tactics are interchangeable words for a solution to the problem. Strategy and tactics have a yin yang relationship in defining each other – bigger long term picture relative to immediate small scale. Tactical means winning battle today. Strategy means winning the war. But the battle had a strategy, broken up into tactics utilized by each team. But each team leader had a strategy, that was adapted in execution by a strategic utilization of appropriate tactics for the resistance and challenges faced. Yin / Yang. Once you leave the textbook, the only difference between strategy and tactics is your perspective. Boxers and quarterbacks have strategies for minutes worth of action. Political strategies have tactics that take months to execute. The difference between strategy and tactics in everyday language is simply to show the short term vs long term perspectives to the task at hand. That would make grand strategy where strategies interact, and grand tactics where different tactics interact. First, conversationally it is good to simply know the effective semantic difference between strategy and tactics. Hopefully your now there. Secondly, in order to be truly successful, you need to have good strategy and good tactics. You need to understand the role of each. Many business have good strategies, but bad tactics and can’t make the strategy happen. In Afghanistan, the US military enjoys tactical brilliance and dominance; they almost never lose a battle; but strategically Afghanistan is a decade old strategic quagmire. Winning every battle yet to win the war. Just like we all know well established small businesses that were tactically brilliant, did great work – but were strategically incapable of adapting to change and simply went out of business when the economy crashed. The simple truth is strategy and tactics are the same skill, same concept applied at different levels. That simple idea is important because you now know that a perfect strategy cannot succeed without good tactics; and brilliant tactics probably won’t deliver strategic results on their own. When your strategies fail for lack of execution, you know there is a disconnect between the strategic and the tactical. So when you are making your decisions, planning, preparing, and executing your vision for the future, remember that you will have to simultaneously view your struggles from both the strategic and tactical points of view in order to succeed. And honestly, you probably need to consider the grand tactical and grand strategic views as well to make your long term life get to where you want to go. Strategically you have one year, two year, five year, and probably ten year or longer perspective, goals, and challenges. Tactically you have a perspective, goals and challenges for this morning, today, this week, this month. Grand tactically you have to manage the interactions between your work tactical situation, your home and personal tactical situation. You may have multiple projects. Health or fitness goals, school, family, or relationship commitments and challenges that affect your daily tactics of that important business problem your are tactically solving now. Also there are grand tactical problems you can’t control – traffic, weather, sickness, accidents. But you have to manage the grand tactical everyday of how do I deal with a getting sick, a fender bender, find a breakfast and still keep my boss happy this morning? At minimum you can think of grand tactical as tactical work life balance. In terms of grand strategy, well; you need to balance work, career, business and personal strategic goals and resources, and how those strategies interact. Grand strategically you also have to consider the big picture – politics, law, the economy – things you can’t control that may have a big effect. There is a good time and a bad time to make investments or purchase real estate – if you’re lucky you find the intersection of grand strategic opportunity with personal strategy – i.e. buy a new home after the housing bubble bursts, not before – if you have the choice. Anybody who bought a house in 2008 either didn’t have a choice, or failed their due diligence of the housing bubble that was well understood in financial journals a year before the market crashed. Grand strategically how do I use limited time and money to get what I want in the long term – career, family, home, car, hobby? In business grand strategy how to I balance supply chain costs with new healthcare regulation costs and changes to corporate tax code while attracting quality talent? Those are grand strategy considerations that form the broader picture of sometimes conflicting strategic goals we have – like put in overtime for that promotion but spend more time with family. And obviously here where we circle around. You need tactical competence on the day to day stuff, grand tactical skill to balance conflicting priorities and limited resources, all while remembering your strategic schwerpunkt …. Not to mention the grand strategy reality of conflicting strategies and the grand strategic environment you are in. Now, you can ignore these truths and keep muddling through the way you like. Or you can try to organize your mind and efforts in terms of the tactical, grand tactical, strategic, and grand strategic – and see if that perspective helps you improve how you manage priorities and get things done, considering short term opportunities within the context of long term goals and strategic constraints out of your control. Yes, thinking like a strategist can and probably will give you a headache. I recommend you start by writing things down. As I’ve learned, if you don’t write it down, it never happened. That’s enough for today. Thanks for reading, hope it helps. Let me know. This entry was posted in Strategy, Uncategorized. Bookmark the permalink. 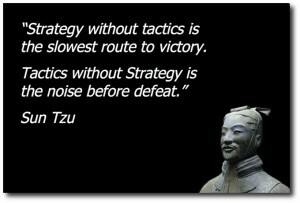 I would say strategy is the what and tactics are the how. A short example of personal finance. Grand Strategy – Make enough money to maintain a comfortable lifestyle, educate my children, and retire comfoprtably. Job Strategy – Get a job in a stable industry that pays enough to enable my grand strategy. Job Tactics – Reserach industries and types of jobs, obtain appropriate education. Identify potential empl;oyers and living areas. Contact potential employers in desired living area. “make enough money to maintain a comfortable lifestyle, educate my children, and retire comfortably” is a goal (or set of goals). A strategy will describe just how you think you’re going to achieve all of that: e.g. go to college so that you can get a good job, but don’t study so hard that you never have time find a life partner; make sure your life partner has similar values and goals; make sure you don’t have more children than you can afford to educate to an acceptable standard, etc… Obviously, your strategy to achieve those goals could be different to the one I just described. 1 – The point I’m going for is that the difference between strategy and tactics is simply what level you are at. Yes, a strategy is made out of tactics. A General commanding 50,000 troops has a tactical battle in a strategic level campaign under a political grand strategy level war. But a Lieutenant commanding a platoon of 30 troops has a strategy for the battle, and tactics applied at the squad (ten men) and individual level to execute his battle strategy. One man’s tactics / tactical level is another man’s strategy or strategic level. Just a matter of perspective and scale. The difference between strategic and tactical is a semantic of relative scope, relative perspective or relative scale. For the purpose of getting things done, they are equally important, and effectively interchangeable words – tactic is detail of strategy, strategic is bigger picture than tactical. But the skills, knowledge and process of assessing, planning, executing, and adapting to achieve objectives – is the same thing regardless of a strategic or tactical perspective, you are literally doing both at the same time, weighing the trade offs between short term and long term. As Far as the what vs the how? Strategy and Tactics are both really about the how. Strategy can be the what. But the what is often influenced by the why? Why can be strategic to… Do you get a college degree because of ego, or because it can lead to better employment opportunities? Why and What are typically as much a matter of emotional choices that ignore logic and strategy. Honestly strategy can be summed up as making the best choices possible to maximize you future choices. That pretty much covers what, why, when, where and how. I think you are looking at things too narrowly. I have encountered many situations where the why was dictated by circumstances outside of the strategist’s control. I have also spent a lot of time doing studies to determine and justify the why. In strategy, as Sun Tzu, the overarching goal is predefined (e.g. by the emperor). The strategist’s role is to determine the best way to achieve that goal given the circumstances / environment encountered. Bother the overarching goal and the circumstances / environment are beyond the strategists control. As strategists, we may be called on to justify why we think our strategy is the best way to achieve the overarching goal, but it is not the role of strategy to determine why the overarching goal is desired. However, as Ted intimates, a strategy is often expressed in terms of a number of sub-ordinate goals, which may be delegated to other strategists, for them to determine the best way to achieve the sub-ordinate goals. Thank you for writing this masterpiece of commentary. I am a procurement professional at a medium sized firm who has an over-arching relative cost savings target of X% and simultaneously the sum of all of sourcing activities along with market effect should fall within +/- x% of the financial budget in order to perform my job to expectations. When I shared a “S.M.A.R.T.” specific cost-savings results-in-progress that significantly over-deliver vs target, I have received feedback that I am being too tactical and not strategic enough. This feedback is difficult for me to accept and incorporate personally and also insinuates that my project that focuses on “tactical” details in order to achieve the over-delivery of savings will hold me back in my career because I am not talking the nebulous talk of great leaders who apparently are masters at thinking strategically. At the end of the day our cost savings targets are part of our corporate C level objectives. So am I forced to be tactical by scratching and clawing at savings opportunitites, while later on being rebuked for not thinking strategically enough. Oh, and by the way, the tactical change, which employs an approach that our business has never thought of before, that I recommended has permanent relative multi-year savings implications of 8.4% forever, that are already set in motion. If this is “not strategic enough to advance my career”, then surely this must be a communication problem or misunderstanding between parties. “Strategic people” to me means people that do not do actual work. It feels like the word is heavily misused in business. In business, it would be very unusual to see a title “Director of Business Tactics”, which would actually be a very unique title. I agree “tactics” arr more respectably used in military context, but feel like an insult in business. Your article will serve as advice on this subject relative to my experience. Reflecting more deeply, “strategy” means in many same thing as “simple”. I am rather distraught because my activities that serve our greater corporate strategy are viewed as “too tactical”. This is disturbing. You remind me of an draft I haven’t finished yet. The strategic meaning of no. – I’m too busy to listen to you. – I have much more urgent problems to deal with right now and can’t afford to consider your idea. So honestly.. Strategy is implemented by tactics. And the semantics are not well agreed upon. As far as the pragmatics of your communication – you need to understand what your organization sees your ideas as, what they think you are trying to accomplish in your communication. This is where you get into politics. Very often friends get bad ideas approved because they are friends. Strangers can be brilliant but ignored because your audience does not trust your intent. I would as how much money does your firm make? Are you talking 8.5% savings on the entire supply chain cost? For a single commodity? A single supplier? It sounds like you were dismissed as being too tactical, because the decision maker you approached had more pressing problems to attend too. If you truly believe in you idea, shop it around with other people you work with, vet it against other professionals and see what they think. I’m guessing it was seen as a “tactical” solution because it’s mired in details that the decision making leadership is unfamiliar with, and they are not sure how to implement? If you are saving 8.5% on 1% of you cost – and it is difficult to make happen, then maybe they have a point. If you are saving 8.5% on your key performance indicators, and it’s not hard to implement… You need to work on selling you ideas. Read the book “Thinking fast and slow” – that will explain the primary reasons why. Tactical solutions often yield strategic results. I think your problem is your persuasion strategy. You are assuming that because you are right, they will agree with you. Being right is irrelevant. Being persuasive is what sells ideas, be they good or bad. Hope that helps and good luck. Feel free to connect with me on LinkedIn if you are active there. Your problem appears to me to be more communication than strategy. I suspect that your boss was just trying to get rid of you. Here are some things I’ve learned over a 40+ year career. Make it short and sweet. You need to make your point in less than one minute. Then give him time to respond. Pretend you are talking to a twelve year old. Your boss may be a PHD but not so smart when he is busy and distracted. When you are growing your career, you are basically a salesman. A soft sell. Your product is your idea. It doesn’t matter if it is strategic or tactical, if you are working at the tactical level, you need to connect to your boss’s level, showing how your tactical solution supports his strategic goals. Thanks for writing this article. Echos what my argument has always been, but the literature seems to define it as black and white. IMO, perspective is key and determines which is which. I’ve decided to store it in my brain as GOAL, Strategy, and Tactics in an effort to simplify it. Ie. Goal is what you ultimately need to accomplish. Strategy being the high level plan of what to do, and tactics digging down into more of the how you will do it.